There's so much to celebrate throughout the year, from Halloween and Thanksgiving to Easter and St. Patrick's Day. 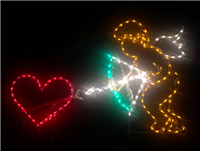 Show your spirit for the holidays, and bring your decorative ideas to life with our still and animated wire yard displays! We carry a wide variety of lighted displays designed to add life and charm to your front yard. Whether you're looking for a spooky Halloween idea for yard art or your Easter lawn decorations could use some freshening up, we have exactly what you need. Shop our pre-designed holiday yard art, including a great variety of Halloween yard decorations, to find great deals on fun, spooky and patriotic displays. Don’t see what you want? Feel free to contact us with your own idea for a display. We hand make all of our art and guarantee quality and integrity throughout.